i saw this, um, two days ago. i noticed it once i got into the vehicle and i was like "wha? a Chevy?" so....? interesting. but the plates didnt look like Mexican plates. imported? That's very possible. Though I do believe they are made in brazil. what stuck out to me was the emblem, looked huge and in a circle. oh and since when? I dig it. I had a feeling it was an Opel. The front end just screamed Opel Corsica, but I never thought they made a pickup variant. I'd rock one with a diesel and five speed, in dark blue. ladies and gentlemen, I give you the new Chevy POS! Best used on those light farm days! 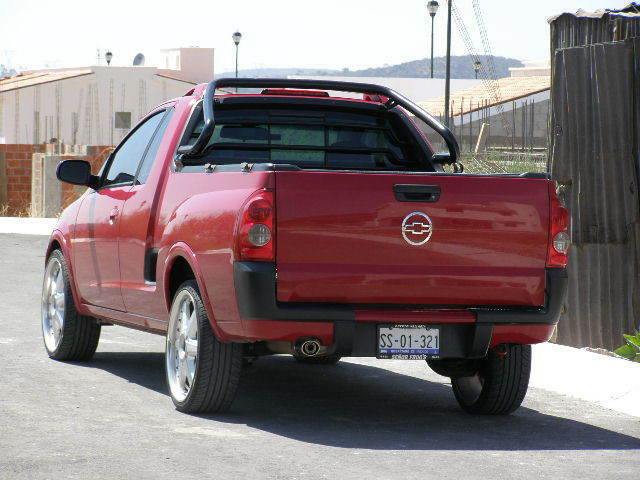 This small front-wheel-drive pickup truck, sold as the Tornado in Mexico and the Montana in other Latin American countries, is based on the subcompact Corsa. It's also sold in South Africa as the Opel Corsa Utility. looks good in that shot lowered. I kinda like it in that pic. once it is lowered it does not look bad and I would probably look at buying it. The only thing is ditch the last of the Tupperware on the sides and bumpers then it would be a seller for me. check out this one on cardomain!!!! Yeah the dark blue one definitely doesn't look half bad. From the factory they look ridiculously blahhh though. Dan, buy me one plz. wow, me likey this one!! !